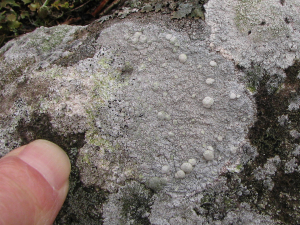 Black spots, possibly sporodochia, on a thallus of a crustose lichen growing on siliceous rock in Brecon Beacons. Diameter of dark brown cells in third picture (in squash x400) is 7 μm. (Edited 1 Jan 2019 - see comment below).